I don't know beans about running... (or cracking jokes, obv iously). 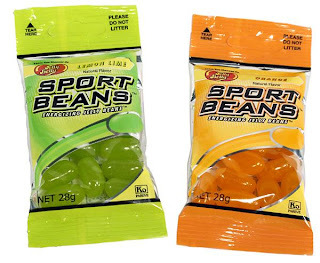 I've been meaning to review these Jelly Belly Sport Beans for a while, but I kept forgetting. I actually don't use these very often, but they taste good as jelly beans. These come in a few flavors -- fruit punch, lemon-lime, orange, and some blue one that I won't even go near because I don't eat artificially blue things. As for taste. they pretty much mirror the taste of regular jelly beans, except they seem less "sugary." I like these because they are nice and portable. I took them on a 20-miler once, but they were not enough to sustain me. One small pouch, which has maybe 10-15 larger-than-normal jelly beans, has about 100 calories, which is less than a gel. Additionally, I'm sure that gel delivers better sugars than these beans do. I am categorizing this entry until the "gel" label, though, because I think in some cases, it can substitute gels. These beans do not upset my stomach, though, and give people who like to chew something to do while they are running those long, long miles besides going out of their minds.